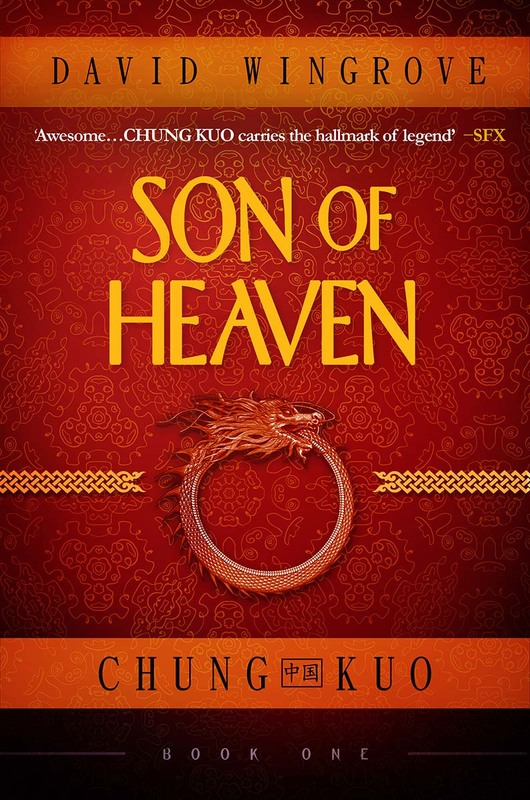 I’ve received word that there will be an official Chung Kuo re-launch party in London on the evening of June 22, the publication day of Son of Heaven. Ironically enough, I’ll be traveling to Shanghai that day, so I won’t be able to attend. Otherwise, I would probably try to make the transatlantic trip. 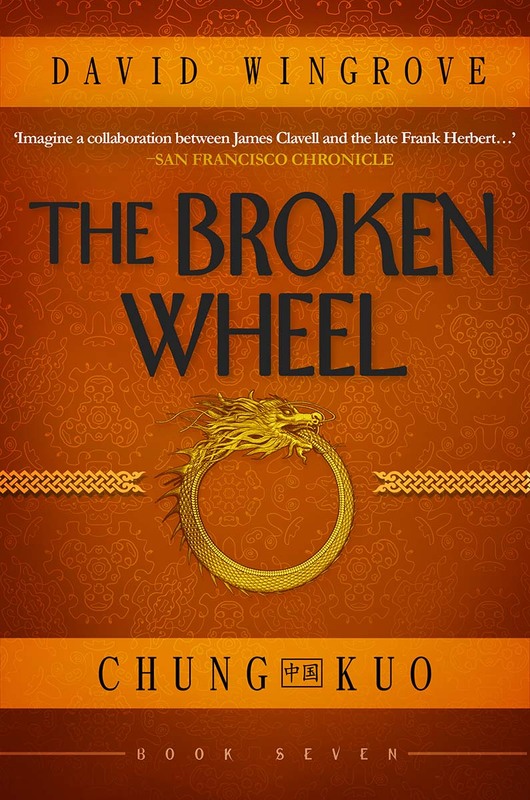 The event will also mark the launch of Fragile Books, David Wingrove’s new publishing company that will be releasing the Chung Kuo series. He’s talked a bit about the new company before. There are a limited number of spaces for this event, so, if you think you might be able to attend, send a note along to Wingrove’s Fragile Media partner, Susan Oudot, at susanoudot [at] btinternet.com to RSVP, and she’ll send along the time and place if there’s still space. If someone can go and provide a report for this site, that would be terrific! Also noteworthy is a new reflection by Susan Oudot on BookBruch, featuring a short publication history of Chung Kuo. 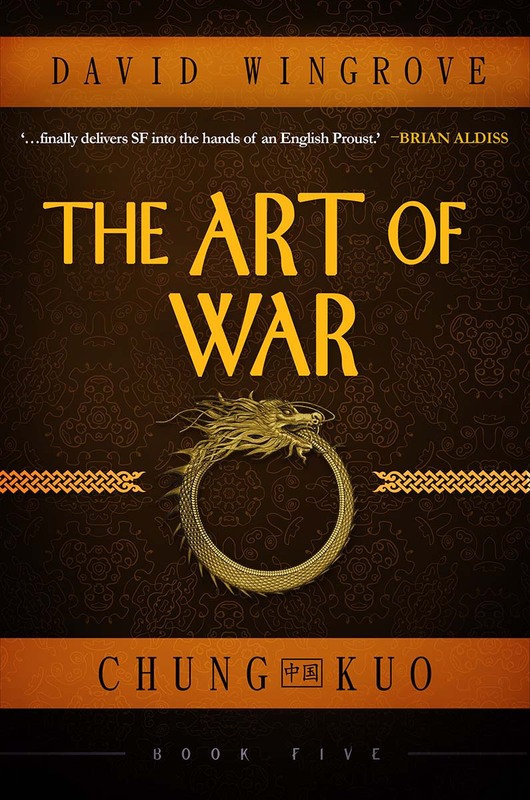 Not too much new there for Chung Kuo diehards, but an excellent read nonetheless. 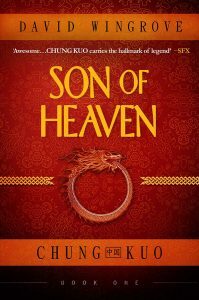 Fragile Books will reissue volume 1 of the Chung Kuo series, Son of Heaven, on 22 June; volumes 2-7 will be reissued over the summer. The new novel in the series, Monsters of the Deep, will be published in September. 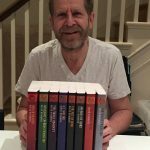 Mr. Wingrove just posted on his Facebook page some photos of him showing off the beautiful proofs of the re-re-release of the first eight Chung Kuo books, featuring the Jim Burns-designed dragon ouroboros. See photos below. Dare I say that they look even better in these photos then they as the raw images? Looking forward to having these on the bookshelf. That is, if Mrs. Giftsandstones will let me make room on the bookshelf next to the all the other Chung Kuo/Myst/Roads to Moscow books. Also… the staff here at Of Gifts and Stones also unanimously support the return of Mr. Wingrove’s beard. This is certainly a good omen for the future of the series release, since it was absent for the Corvus release (and look what happened there). Back to finishing Master of Time. More news as it comes. Master of Time has shipped! 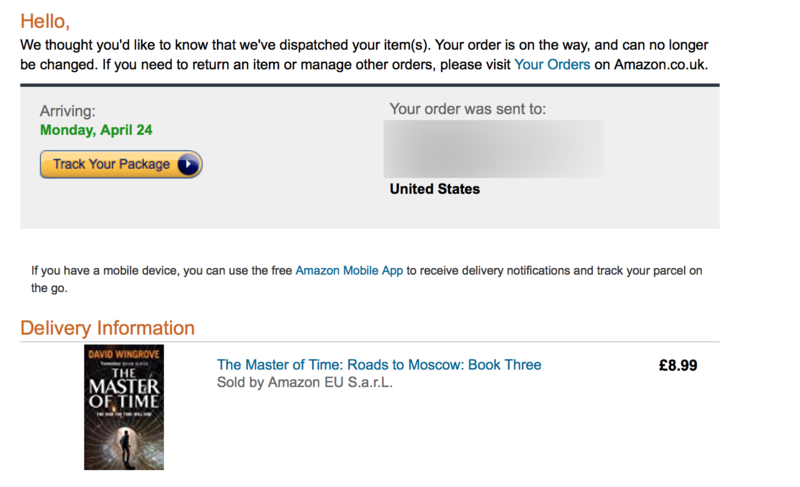 I just got my email confirmation (as have several of you who noted in the comments) that Master of Time, the conclusion to Wingrove’s Roads to Moscow trilogy, has shipped. Unfortunately, since I live in the USA, Amazon UK is sending it via carrier pigeon or tugboat or something, so it’ll be a while before I get my hands on it. The American release date is in July, it seems, although the Kindle version is available in the states tomorrow. I might have to do that. Happy reading, to those of you who get it soon! Posted on April 5, 2017 Categories News10 Comments on Master of Time has shipped! 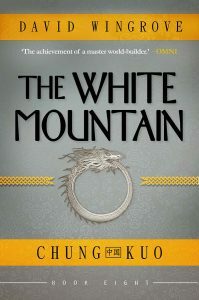 Here you go: the first Chung Kuo covers from the forthcoming re-re-release. Click on each image for the full size version. I think they look better together than they do individually and will stand beautifully on the bookshelf (or e-reader). The first eight books will be released in trade paperback and e-book this spring, and Book 9, Monsters of the Deep, will be released shortly thereafter. 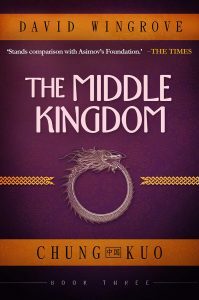 That’ll be the first Chung Kuo release in three years! More news at it comes! 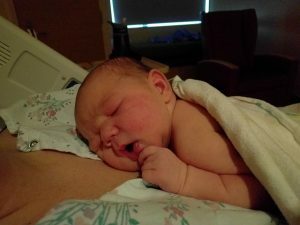 Otto Meleyco Shaffer, born Dec 15, 2016 at 5:11 pm Pacific time. His first name was inspired by Otto Behr, from Roads to Moscow, and his middle name is a Russian family name from his maternal grandmother’s side of the the family. 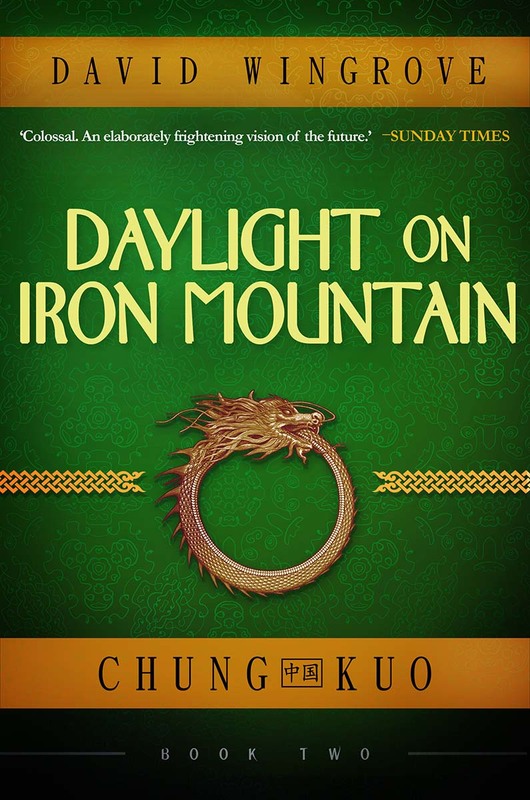 David Wingrove has just released on his Facebook page the first of the new covers for the Chung Kuo series, now under his control and to published by his own imprint, Fragile Books. The next several covers should be released soon and will follow a similar motif, including the Jim Burns-created ouroboros, but will vary in main color. David also tells me that his official website will be launching very soon, once the first series of covers has been finalized. What do you think of the new cover art? Leave your thoughts in the comments. More news as it comes. David chimes in with some more updates and clarifications. Big thanks to him, as always, for keeping us in the loop! 1. 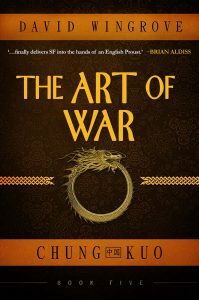 It’s important to emphasise that getting control back over Chung Kuo means the whole of Chung Kuo, not just English language editions, but throughout the world. First time around, back in the late eighties, early nineties, this involved Chung Kuo having fifteen overseas editions (apart from British and Commonwealth, USA, and Canadian rights. With Corvus, the only deals they got were for Turkey and Indonesia. Added to that I personally obtained a French edition through L’Atalante (which covers the opening 8 volumes). Oh, and I’ve never seen a copy of either the new Turkish or Indonesian editions. What having control means in this instance is being able to take the new format versions to the London Book Fair next year and stir up interest. We may even get a stall, to promote Chung Kuo. This ought – we hope – to get the series out there – in the clear view of foreign publishers. Reversion – Okay, but why not a new publisher? 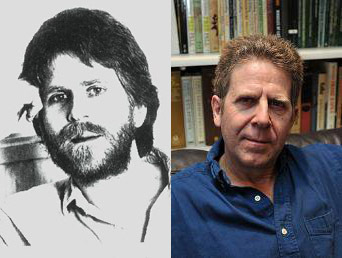 Hodder, perhaps, or Head of Zeus, both of whose Senior Editors were once great champions of Chung Kuo? My answer – because once more we would be losing the most important element in a project this large – control. 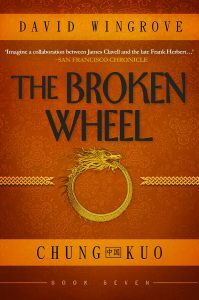 Even with the best of intentions and the very best of editors, Chung Kuo has stumbled and fallen twice. That’s not going to happen again. This time we do it and we do it right. And backing me up in this endeavour will be my wife, Susan and my daughter Amy, who, incidentally, writes a mean fantasy novel, as you’ll discover in the next year or two. Oh, and please note that Fragile Books is owned and run jointly by Sue and I. Also that – for starters – we’ll be issuing new e-book versions, and, not too much later, print on demand versions. But eventually the aim is to get the physical books into the bookshops – something Corvus failed to do. Re-launch. Crucially important as once more it means ‘control’. It also means that I can keep that promise I made back in 2011 that the sequence would be completed with a brand new four volume finale that addresses all of those matters my critics – back in 1997 – raised. And there’s a big bonus for those of you who’ve been patient – some complete non-Chung Kuo never-before-published science fiction novels – THE BEAST WITH TWO BACKS – about two psychopathic and telepathic twins, IMAGINE A MAN – about memory and love, and THE WOUNDED, a 60,000 word space opera. 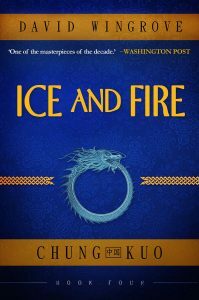 They’re good books, all of them, and if they go well, I might even release – for the real die-hards – A PERFECT ART and SPRING DAY AT THE EDGE OF THE WORLD – two early versions of CHUNG KUO, when it was still a single novel project. Before I wrote the 750,000 word version which was subsequently carved up into CHUNG KUO. Not included in Matt’s summary – and sitting alongside his newly re-vamped site – there’s the new website, which will relate not merely to the Chung Kuo series but to ROADS TO MOSCOW and MYST. There will also be a regular update, with extensive blogs and reviews of other sf novelists. In which vein I ought to mention that I’ve signed on to write an introduction to a new special boxed set edition of CHILDREN OF DUNE which will be out at the end of next year. The possible TV deal. This includes a possible franchise and all manner of spin-offs – audio books, computer games, comic books, graphic novels and possible stand-alone movies of SON OF HEAVEN and DAYLIGHT ON IRON MOUNTAIN, neither of which (as it’s currently planned) will be included in the TV version. 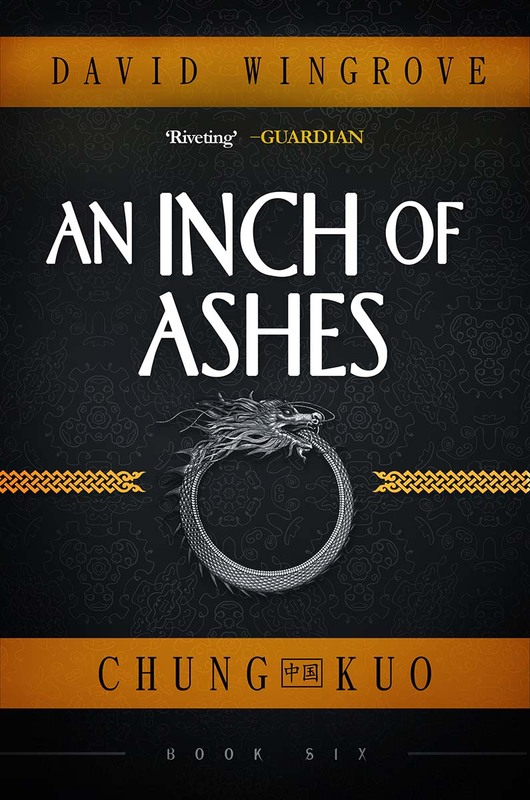 But it’s crucial to state that even if Chung Kuo doesn’t come off as a TV series, it WILL get published through to the final volume, the final sentence. You see, control is the key to all of this. We have the resources to do this, all that’s needed is the sheer will to see it through to the end. Oh, and I ought also to mention that one of those four ‘finale’ books is already written. It just needs a good polish. That’s it for now, guys. More in a week or so, when we’re back from Lanzarotte. PS – Jim Burns is an old friend of mine from way back (the seventies) and he did the American versions first time round. He’s agreed to help us get this rolling, but I emphasise, Jim isn’t doing big illustrated covers like last time, He’s providing us with a central logo for the new launch. Oh, and just to clarify, I consider Jim the finest science fiction artist in the world and am honoured to be working with him, in whatever capacity. 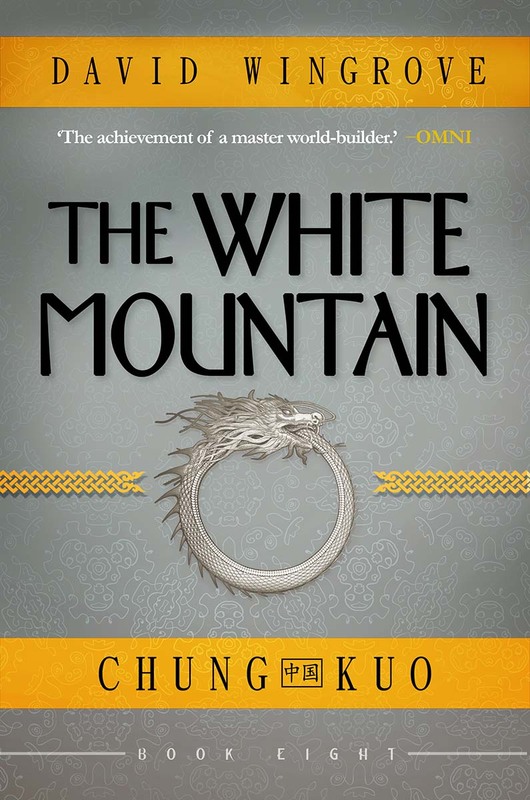 As promised, David Wingrove’s big Chung Kuo news. Good times ahead. 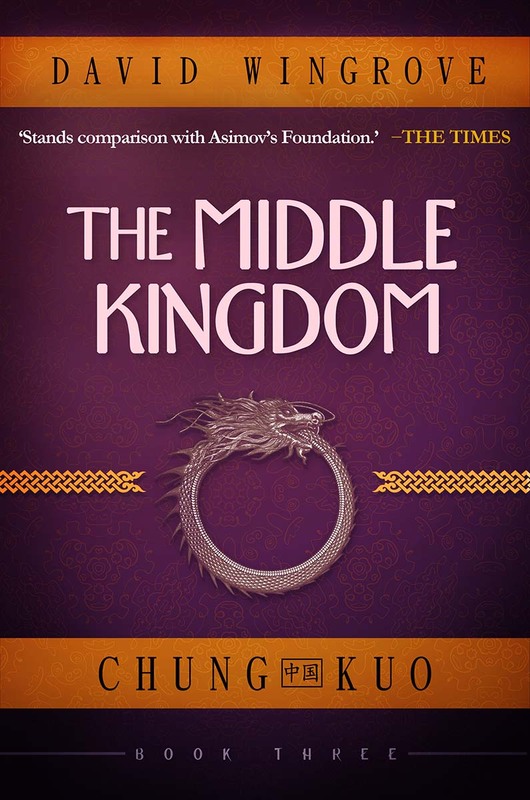 Not for the first time, I’ve recently found myself in a kind of limbo as far as the CHUNG KUO books were concerned. 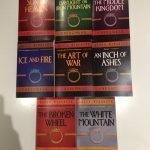 With Corvus hanging on to the rights to the first eight, there was little we could do, unless we wanted to put out the rest of the sequence – Books 9 to 20 – in different covers. That is, if we chose to go the self-publishing route. Of course, we could have continued the sequence in the same jackets, only at £1500 each new jacket image and a further £500 a time for the special cover design, that’s £2000 a cover, times 12, or £24,000 just to keep that wonderful visual look. And that’s not including what it would cost to buy the old formats off of Corvus! 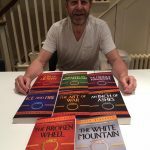 In terms of writing, creative writing that is, it was a good job I had the third and final book in the ROADS TO MOSCOW trilogy to finish and re-work, and polish and copy edit. Which is what I got on with, re-casting the original Book Three – written in most part more than ten years ago – with a whole new ending – one that was darker than before. All of which is now done, the final polish made, the book – THE MASTER OF TIME – two weeks off being ready for its early April publication date. But that wasn’t the only thing I did during that latest hiatus. For a start I helped get the material together to go out in the new website which will be launched in late November early December. A website that’s almost ready to go, and which my daughter Amy’s incredibly gifted web-designer boyfriend, Ben, has made for me from scratch. Oh, and before you ask, OF GIFTS OF STONES will still function alongside, utilising the same kind of material it’s featured these past five years. You’ll still get the chance to make your comments on how you see things going. Oh yes. In anticipation of getting the rights back, we’ve launched a new venture, FRAGILE BOOKS, thanks mainly to the efforts of my wife, Susan, my second daughter, Amy, her boyfriend Ben and, last and very much least, me. Having finally got somewhere in our negotiations with Corvus to get the rights back, we finally got word from them that they were willing to revert. One week later a letter came – an official document – saying that CHUNG KUO was now mine once again! You can’t imagine how that felt. To not be at someone’s mercy or whim. To have control over all that wonderful material once more. No. I have to go back four years to tell this next part of the story. Because this is what I’ve been keeping from you throughout this long silence. Four years ago I had a wonderful three hour lunch with a man named Stewart McKinnon, who – in partnership with several others – runs a media company called HEADLINE PICTURES. We got on well back then and talked about developing CHUNG KUO for either film or television. For various reasons, however, that wasn’t to be, and I signed rights over to a big American TV producer, who bought them for three years and did…. Nothing. Those rights reverted to me in December 2015. The same day I emailed Stewart. 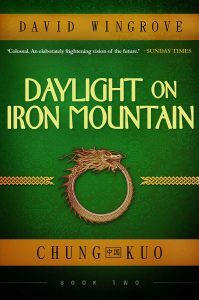 Are you still keen on developing CHUNG KUO? I asked. He said he was and took me to lunch for another wonderful long session. Only this time we took things further, meeting up in Headline’s offices in Golden Square in the middle of London, once or twice a month for the next six months, slowly building a whole new CHUNG KUO scenario. In fact, not just one, but four different synopses came out of this process, the final one of which was IT. What we had been working to all that time. A contract followed. As luck and coincidence would have it, just two days after the reversion document plopped through the letterbox. Now, before some of you out there ask the question, HEADLINE got a lot of praise, and several prestigious media awards, for making and producing THE MAN IN THE HIGH CASTLE, and in the six/seven months we worked – as a team – on developing CHUNG KUO for television, I understood why. It’s rare to find a group of people so intelligent and keen as Stewart, Jess and Christian at Headline. Right now they’re putting together a funding package. And then? It’s exciting, but hardly a given. One doesn’t count chickens and a lot of wood has been touched. Against which the time seems one hundred per cent right to make CHUNG KUO for television. All of you know how rich it is, how darkly yet accurately it reflects the world in which we live. I’m afraid the answer is… nothing… not yet. We’ve a long way to go and it would be hubris indeed to say it will get made, but I have a great trust in the team I’ve been working with. I imagine it’ll take a good 12 to 18 months to get to the stage where you could see something. IF it ever gets made. 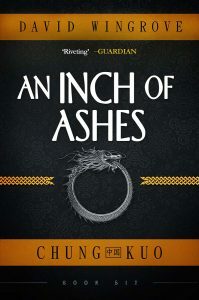 But in the meantime I’ve several other CHUNG KUO related tasks, like getting the first 16 books out in new packaging, and re-writing the last four books in the sequence. Towards the last, we should be getting the new jacket design this week, and the logo a few weeks after that – courtesy of Hugo award winning artist Jim Burns. So the coming months are going to be busy. Busy, busy, busy. So wish me luck. 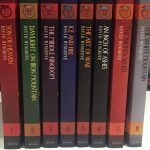 We’ve pencilled in a re-publication date for the first eight books – in the Spring of next year – maybe even the same day as MASTER OF TIME is put out. Then it’ll be one new book roughly every two months until the end of the year (which’ll take us up to book 12, maybe 13). At which point things might slow a little, if the TV project gets off the ground, because I’ll be acting as creative advisor if we get things going. Which won’t involve me writing scripts – that was established very early on – but will see me have a kind of steering role in things. The gentlest of hands on the tiller, if you like. 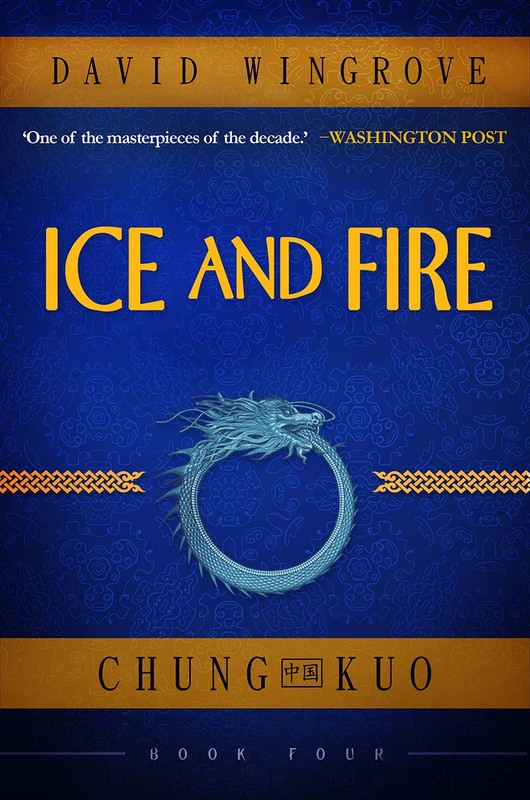 I know all’s been quiet on the Chung Kuo front for a while, with several folks asking if there’s been any update regarding the release of the remaining books in the sequence or about who’s holding the rights to the books. Yesterday, Mr. Wingrove personally reached out to me and promised a big update to come in the coming weeks, hopefully by the first week of November. Although I don’t have specifics to share, I get the sense that this is going to be very good, very interesting news.